Karen did the cutting and spicing of the pork butts for this batch. On Sunday we ground and stuffed the casings. Funny how some mistakes turn out for the better. Didn't realize we were out of hog casings and had to use some beef casings we had on hand. This allowed us to make thicker sausages. I smoked them on the Egg, in batches, using peach wood for smoke. After chilling in the fridge overnight, we vacuum sealed and put them in the deep freezer. We kept several pounds as bulk which didn't get smoked. We have several recipes that use the bulk, including Andouille Gnocchi with spicy tomato sauce. We have an LEM grinder and stuffer that handles 5# batches. 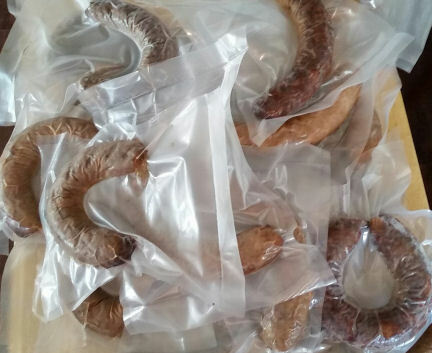 The beef casings are called "Rounds" and are 43 to 44 mm. I forgot the reason we originally bought them. I just use my Kitchen Aide, but it's been awhile. Definitely a 2-person job for me. We used the KA for a long time, but it tends to get warm to hot when you are grinding large batches, which we do. Plus, the LEM is SO much faster than the KA. I don't think it even took 30 minutes to grind just over 17 pounds, probably a lot less actually. You don't really need a second person for the grinding part, it's just nice to have one to watch how the bowl is filling up with the ground meat. I guess if the stuffer was actually attached to some kind of stand (it has holes in base to do so), you really wouldn't need a second person for that either but it's a lot easier for 2 people to stuff than 1 in either case. Speaking of the KA, before he got the LEM, I had gotten him some after-market dies and cutter blade for the KA because of some research I had been doing via some sausage-making forums. Several people had mentioned how much they liked the after-market blade. It did help some with the cutting (slightly different blade design) and the new dies gave him a little more choice in grind sizes. If you are interested, I'll look back and see if I can find what I got for him.